I may have mentioned before, but in case you missed it, I love making cheese. In fact I love it so much that a few years ago, once I had about 20 varieties under my belt, I thought it was high time to pass on my cheese making skills. That’s one of the reasons why I started the Little Green Cheese website & Podcast, and why Kim and I started our small business, Little Green Workshops. 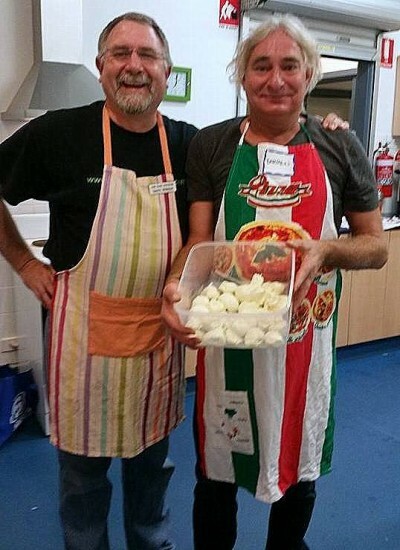 We have added other courses besides cheese making, but my favourite is our Mozzarella & Ricotta workshop. I have so much fun, and I believe (from all reports) that the students have a ball as well. Let me walk you through the setup from a class I taught yesterday. One of the venues we teach at is the Melton South Community Centre which has recently moved into a new premises (just across the road). 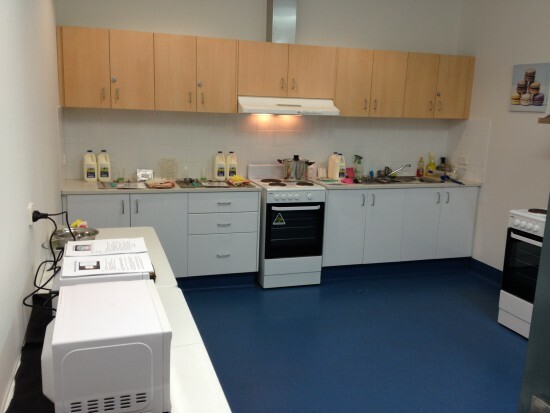 It has a massive training kitchen with lots of bench space and two stoves. 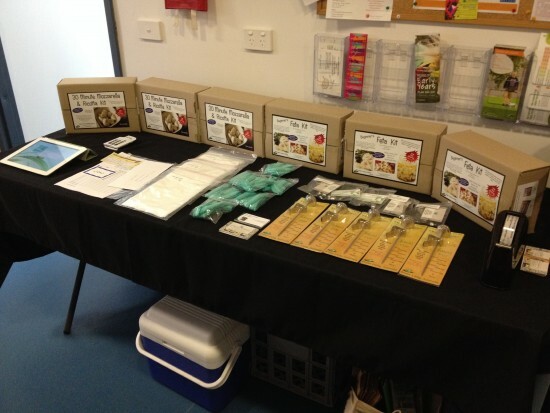 Ideal for a smallish sized cheese making class. There was also room to put a couple of trestle tables that allowed space for two microwave ovens. 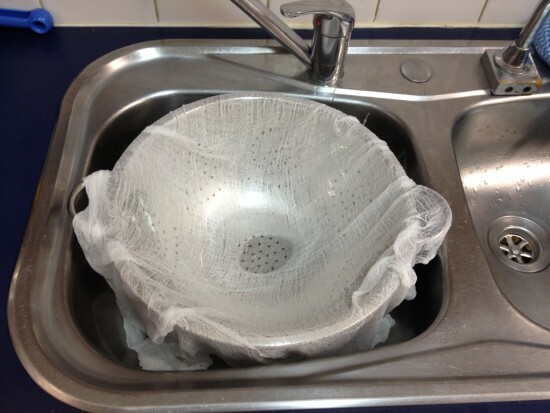 It also has two sinks which makes draining curds and whey a cinch. 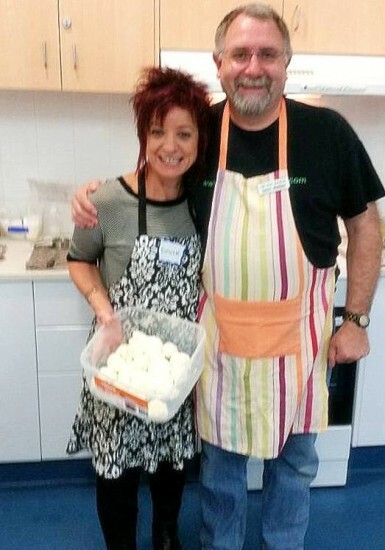 So, we had the space to teach five eager people who wanted to learn the art of cheesemaking. Firstly after a showing all the ingredients and a sanitisation brief, I gave a Ricotta demonstration that took about 30 minutes. As I was using pasteurised/homogenised milk, it wouldn’t play the game and curdle, so I had to add extra acid and in the end I got desperate and added a little rennet and left it to stand for about 30 minutes. That seemed to do the trick, and the 4 litres of milk yielded about 600gm of creamy, albeit tangy, whole milk Ricotta. Kim is going to use it to make her Chocolate Ricotta tart tomorrow. Yum! 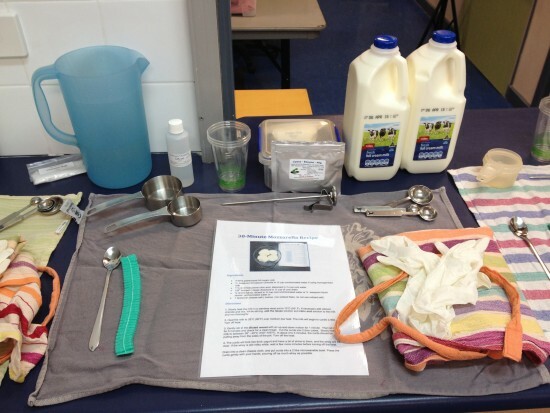 After a quick walk-through of the Mozzarella recipe, it was now the student turn to have a go at making cheese. I find it best if we all step through the procedure together, firstly measuring all the ingredients into cups and diluted with the required amount of pure water. Then I guide them through heating the milk, adding each ingredient, and finally draining the curds and heating it up for stretching. Once it is stretched, they then lightly knead unto shiny, form into one large ball (mozzarella) or little balls (boccaccini) which are then dunked into iced water so that it cools quickly and maintains its shape. It is about this time that the students get their first taste of real cow’s milk mozzarella. Smiles all round! And oh, the wonderful Mozzarella! Some of you who follow my cheese blog may have seen Darren before. He featured in Episode 4 of Season 2 of the Little Green Cheese Podcast. This is one man who loves making cheese as much as I do. Once everyone have washed up their pots, I invite them to peruse my little on site shop. I always take along a few things to sell, because someone always wants to make more cheese when they get home! I remind them that there is a comprehensive range of cheesemaking kits, ingredients, and equipment over at Little Green Workshops if they get bitten by the turophile bug. We then say our goodbyes and I start cleaning up the kitchen. 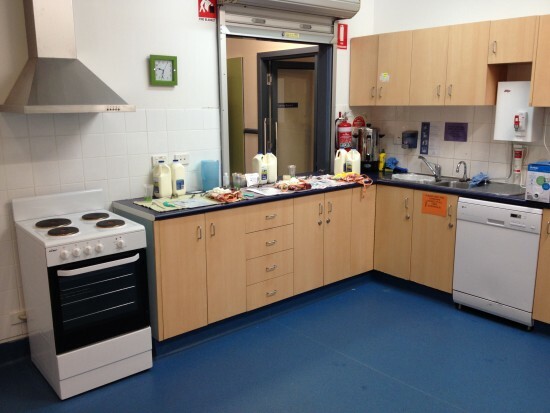 I like to leave it cleaner than when I arrived, because it helps the community centre out. It is the least I can do. So there you have it. That is how Operation Mozzarella & Ricotta panned out yesterday. Loads of fun, and a great way to spend a day off on the weekend. Did I mention that I loved making cheese? This episode is essential listening for gardeners at all stages, from raw beginner through to the seasoned green thumb. It has a little something for everyone, even if you don’t currently have a garden, but are wondering what tools to buy or borrow before you start growing your own vegetables. 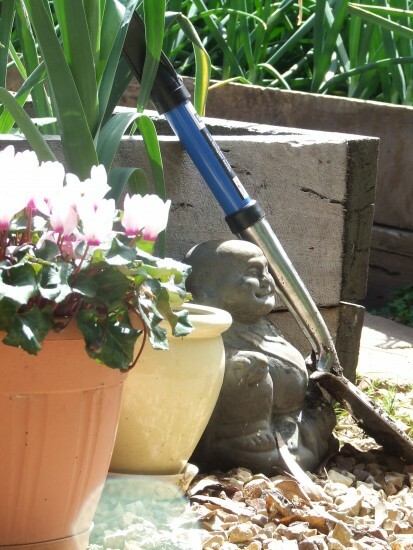 I list and describe my top 8 tools I use when gardening, every time that I venture into the patch and orchard. So there you have it. All very simple, and mostly inexpensive tools that I use when gardening in our suburban food farm. I hope that each and every listener got something from this episode! Don’t forget that this show is financially supported by you, the listener, via Patreon. If you believe the show adds value to the sustainable living community and you would like to support the show, please pledge your support at http://www.patreon.com/greeningofgavin. Any pledge small or large is most welcome, as it keeps the show growing week by week. And finally, do you think this podcast episode will help someone you know? If so, help them out by sharing it using the social media buttons below. And if you are super excited about this episode, pop on over to iTunes and leave a rating and review using the button under the player. It helps the podcast get noticed in the charts and makes it more visible for others who may be interested in living a more sustainable lifestyle in the ‘burbs. 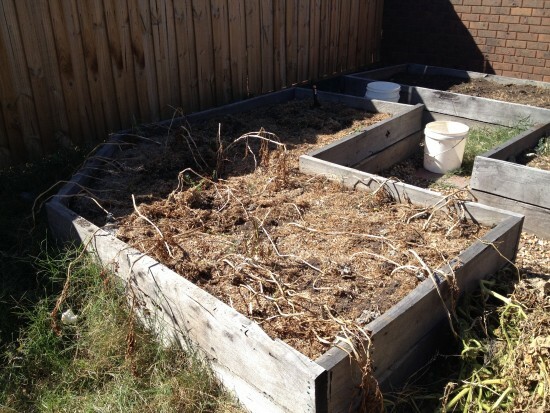 Growing your own food is sometimes a challenge. It is especially challenging when you make a gardening blunder that costs you six months of work! So what did I do and what did I learn? I learnt never to plant potatoes in the same bed as pumpkin. Let me tell you a little story of why. Saturday morning. I was all geared up for gardening, because earlier in the week I had harvested a somewhat modest crop of pumpkins and squash. Within the same bed, and in between the rows of pumpkins, I thought I was being quite clever, and planted potatoes. Two varieties, Sapphire and King Edward. Saving space, I thought I was. Well it was not as clever as it should have been. How do I know that there should have been more? Well, I had a control plant! 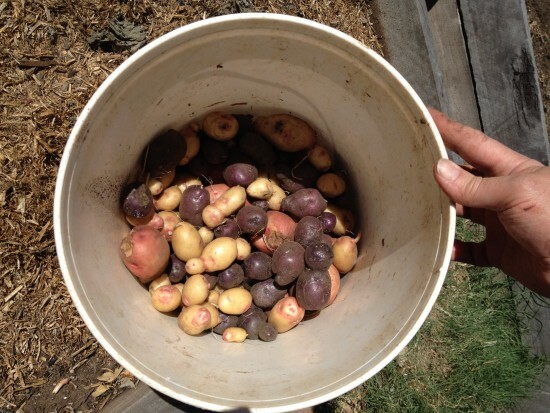 In the other large garden bed that had no pumpkin plants, I had a willing volunteer in the form of a single Desire potato plant that I missed when I harvested last years crop. From that one plant I harvested about 2 kg of spuds. At this stage, I was excited, thinking that the front bed would have a massive harvest. I was so psyched that I had two 15 litre buckets at the ready. So on to the front bed where I had sown two bags of seed potatoes. 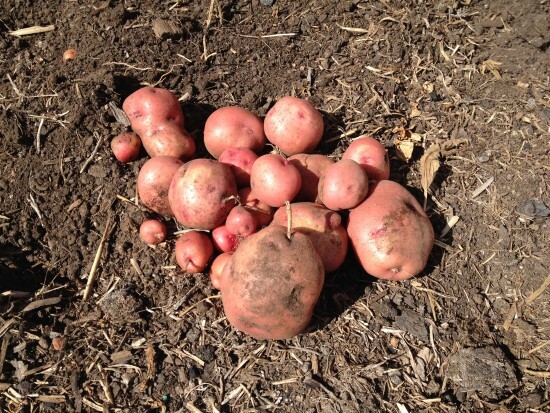 The potato plants had grown strong during the summer, and there was little difference between the two varieties and the control plant above the ground. All the plants had died off, so now it was time to harvest. However, after about 40 minutes of hard graft, a few cuts from digging deeply into the bed, all I got for my labour was a couple of handfuls of piddly little spuds. The one I am holding in my hand is the Desire from the other bed. It is not an optical illusion. 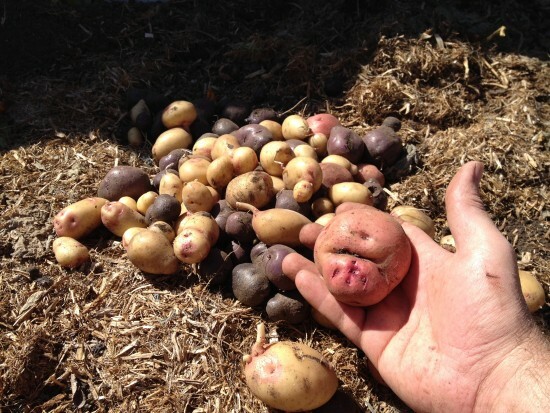 My hand is resting on top of the other potatoes! The Sapphire and King Edwards are tiny. Here is my final haul. Only quarter of a bucket. 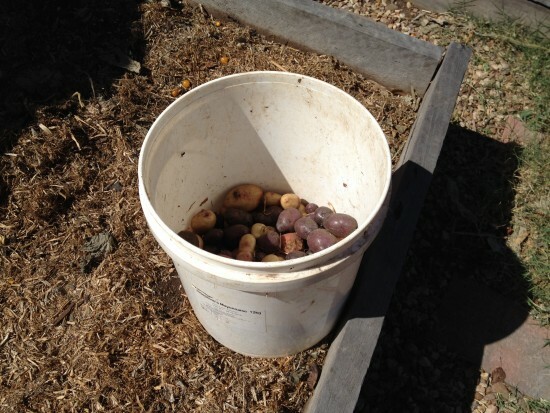 Last year from the rear bed, I harvested enough spuds to fill two of these buckets! 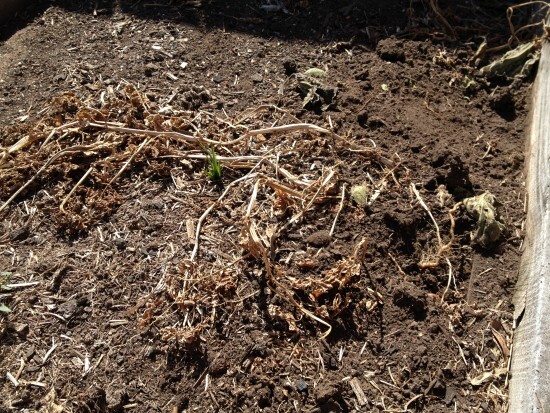 A gardening disaster, six months in the making! I thought it may have been the dry summer season, but I did water the bed at least once a week to keep it fairly moist, and it was also heavily mulched with pea straw to prevent evaporation. It was quite mild with few days over 40°C, so the plants didn’t burn. So I did some research. I hit one of my favourite gardening websites, Gardenate, to determine what one should grow with pumpkins. To my shock, all was revealed! It said avoid growing in the same bed: Potatoes. Well there you have it. The mystery of this years pumpkin and squash failure and the following potato famine has been solved. So repeat after me. I Will Never Plant Potatoes With Pumpkins Again! It’s just not worth it. But the great thing about gardening is that I can try again next year. Now I know what doesn’t work, I can avoid that problem and should have a bumper crop of both. If anything, this gardening fail has made me more determined. I am so looking forward to the Easter break, as I will be planting up a storm!